Why Choose the Philippines — Is Malaysia a Better Choice? I originally wrote this about 8 years ago. It was in response to a lot of mail I was receiving on the subject of what country was “best” to live in for US expats. At the time, Malaysia was advertising The Malaysia My Second Home program and many expats wondered how that program compared with what was available to retirees in the Philippines. Significantly updated and corrected. Only a few things have changed in 8 years, mostly making it even easier to stay in the Philippines. That’s a very good question. Why choose the Philippines instead of the nation of Malaysia for retirement, or just an escape from the western world rat race? [Read more…] about Why Choose the Philippines — Is Malaysia a Better Choice? Guam Divorces for Philippine Marriages. Recently I’ve published several articles on divorce in the Philippines. We’ve also mentioned the idea of the foreigners (non-Filipino) member of the marriage going to a country other than the Philippines. They can obtain a divorce in the foreign country and then their Filipino partner can file a court case in the Philipines for recognition of the foreign divorce. This process will then free both members of the marriage to be free to marry again, in any country, anywhere. Now, Why Would An American Go To Guam For A Divorce? Well, there are a number of possibly good reasons. Here’s an article I republished many years ago and just recently updated. And updated yet again because of some activity in the area of divorce law, and statements made by the Pope on a visit to the Philippines. Here’s an excellent article that will serve as a primer on the way divorce, annulment and citizenship work in the Philippines. It describes the strange and often cruel way the laws about marriage, divorce, annulment and citizenship are applied to citizens of the Philippines (especially, female citizens). The story of Rosanne in my column last week triggered numerous reactions from readers that merit discussion. As a jump-off point, we shall encapsulate Rosanne’s case. Her Filipino husband who used to be loving and conscious of his familial obligations, abandoned all his duties toward her and their children when, as a result of his prolonged employment abroad, he found a new love. He then divorced her and married his lover with whom he now has two children. But you have to take into account that here in the Philippines, logic does not always apply. I’ve had a number of online conversations lately about folks in the same or similar situations as the lady described in Attorney Jimeno’s article. There is always a lot of discussion when a foreigner and a Filipino marry, often centering around where the marriage should take place and where, or when (if ever) they could divorce. Now to most people’s logic, “marriage” and “divorce” (or “annulment”) are binary options. You can’t be in both situations at the same time. Why another article on Philippine divorce so soon? Well, I can tell by the listing of search terms that show me how people find this site that a great many people are searching for news of what many think is a near-term “loosening” of the laws that prohibit divorce in the Philippines. Perhaps even divorce itself is soon to be legalized … or at least some rumors say so. Here’s Some Recent Philippine Divorce News. 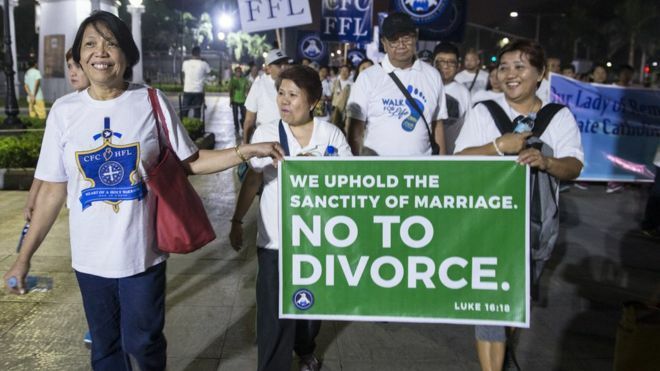 Divorce remains illegal in the Philippines, which has a large Catholic population. The Philippines’ lower house of Congress has passed a divorce bill on the third reading, moving the country closer to legalisation. A few days back I published an article here where I made a huge error in the title. I never should have used the word “Final”. Never say “never” or “final” or “ultimate” unless you have an iron-clad assure that this will actually BE your final word. Also, I published this article (below) recently as well, detailing why (at this time) moving back to the USA was not the right decision for my wife and me. One of the major things I talked about in those two articles was the ridiculous costs for many things in the USA, compared with what I have to pay here in the Philippines. Final Charges are like Final Decisions. Along came a charge on the US credit card I had used to rent a car in the Philippines. Even though I had a receipt from that company, issued when the car was turned in that said “Final Charges”, I now find I have to pay more than $122 USD for “Airport Taxes and Usage Fees”. Philippines Divorce. Is There Divorce in the Philippines? What a silly question. Many of you may be saying. “Everyone knows” there is no divorce in the Philippines, don’t they? Well, in general, this is true. Before going further here I am going to give you a homework assignment. Read and consider this excellent article by attorney Joyce Domingo-Dapat. Not only does she explain most of the situations you might encounter, but unlike me (who has no standing as an attorney), attorney Domingo-Dapat is a practicing Filipino attorney and thus speaks with authority. Final USA Observations On The Way Out The Door. Regular readers will recall I just published an article recently detailing some of my thoughts on staying here in the Philippines or going back to the USA. You can read it here, and I feel you ought to if you are anywhere near as conflicted as I am over the “move back/Don’t move back” question. Go ahead, I’ll wait for you here…. How long can you stay in the Philippines if you are a US citizen? I’m a US citizen and I want to know how long I can stay in the Philippines if I decide to retire there? Simple Answer — A Long Time. Now, how long is a “long time”? Well in contrast to the USA, where visitors (if they can even GET a tourist visa) are normally limited to a 90-day stay, with no extensions, the Philippines is a dream country for international nomads for overseas retirees. Your passport (valid for at least 6 months at the time you enter the Philippines). Proof of Onward travel within 30 days of your arrival in the Philippines. That’s all? Yep, that’s all you need to get in the door. From that point onward I’ll show you how to stay here in the Philippines legally for up to 36 months. There are other visas you can get which let you stay even longer (up to the end of your life), but this is the KISS section, so let’s just stay with the initially free to anyone tourist visa. [Read more…] about How long can you stay in the Philippines if you are a US citizen? Still Keeping Me Rudely Awake. Three years ago I wrote about some current costs in Colorado and why the Cost of living Philippines is often 1/12 the cost of the USA. It’s summarized below. Why bring up something three years old today? Well, my wife and I are currently in Florida, getting ready to return to our home in the Philippines in just a few days. Many of our experiences on this trip are about the same as our trip three years ago. A primary purpose of this trip (October 2018) was to “sniff the air” if you well, to see if we both might decide it was time to move back to the USA. I was recently diagnosed with chronic obstructive pulmonary disease (COPD). Not very happy news. But I’m taking steps to minimize the issues (like getting off those damn cigarettes (yet again)), losing weight and other health-promoting things. Many of my readers, of course, know this, but every month I get contacted by people who want to know the answer to things like “What hospitals in the Philippines “accept” Medicare”? and similar queries. The answer is short and simple (although harsh to some). None. US Medicare does not pay at all for any procedures or care received outside the USA.